Nestled in the trees, this home is waiting for you and your perfect mountain get away. The large deck surrounds the entire house providing shady and sunny spots depending on what you need. Trees coming through the deck give it that much sought after Idyllwild ambience. Floor to ceiling windows in the living room invite the outdoors in, while you remain cozy inside next to the wood stove. Close to town, but far enough away to be that quiet retreat. This is the perfect retreat for two couples with two bedrooms/two bathroom. 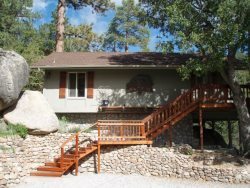 Come experience your idyllic Idyllwild retreat. Third room set up as an office, complete with desk.